The out-of-the-ordinary always captures our attention! And on this day it was no different. My family and I had just parked in the underground parking in preparation for an afternoon of shopping at the mall. We had stopped in front of a Mini, a car that is known for its smallness. What made this particular vehicle cute, though, was the addition of eyelashes. 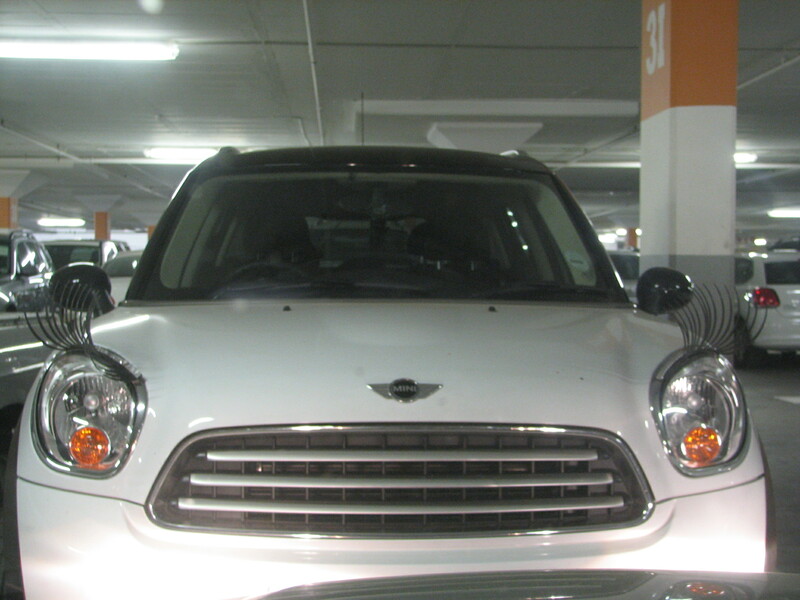 Have you seen these eyelashes on cars? Two years after seeing it, my girls still talk about this sight. Awwww! That is such a cute car. I just wanna cuddle it and take it home..though I’m sure the owners would not approve of my plan..Lol! We saw our first one of these with the eyelashes just two weeks ago, it was bright yellow and darling! Did you have your camera in hand? i’ve seen these cute things. There is a wink version too. I haven’t seen that version. I shall now be on the lookout! Cute car and cute article. Thanks for sharing this. It put a smile on my day. I was lucky I had my camera with me so I could snap a memory. I have not seen another since. Not really she was still very young and had a toddler, maybe that’s why she put the lashes on. Maybe it reminded her of a time before she was a mother. I am sure she did a lot of things for fun. Good capture, Colline. The world needs more whimsy. I couldn’t agree more John. I am sure these eyelashes cause many smiles each and every day. I’m impressed that you took this shot 2 years ago and still called it to mind for Paula’s unchallenge 🙂 Though, come to think of it, it is pretty memorable. Nope, never seen one. Indeed! I love small cars like smart cars. The concept of it is so cool as well. I want that, too! But my car, whose name is Mercedes although she’s a Mazda, isn’t cute enough. And besides it’d be a dead giveaway that I’m a lady. I totally want a flirty mini cooper even if it’s not practical! Never seen that before, but it suites the car. So cute. It is when I was in South Africa that I saw it Sonel. Never seen it here even though we have kept an eye out. your British female Mini staring at me, made my day, thank you, Colline! Certainly different, the owner must have a good imagination. I saw one the other day with eyelashes in London but didn’t have a camera on me. They are cute. What make of car was sporting them? Haven’t seen one yet. The kids would LOVE it! I wonder if they do lower ones as well? Now that would make the mini look even cuter! LOLLOL. Yes, this Mini certainly does look flirty! Flirty…the perfect description for this cute car. Wouldn’t it be nice to see some of these on the road? It would certainly put more smiles on drivers’ faces. Oh yes, Colline. I’m all for more smiles and laughter as you know! Well spotted, they are so cute. 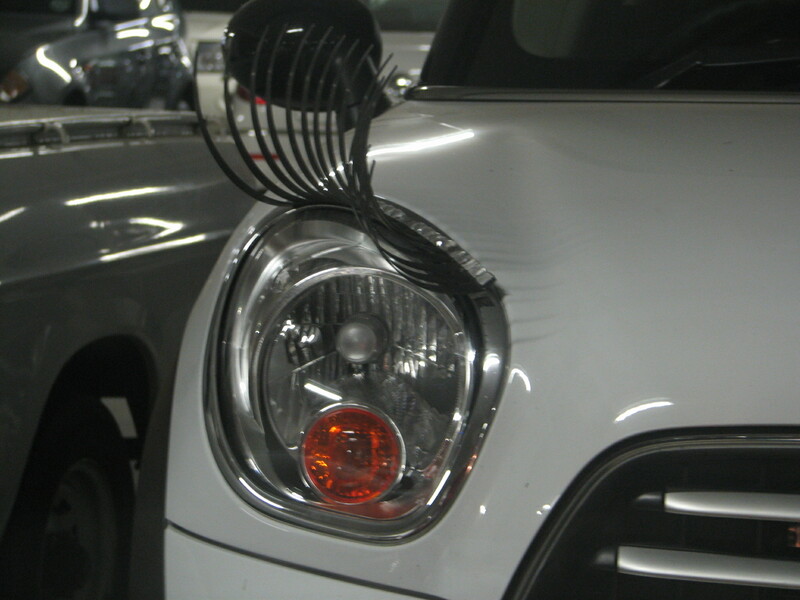 You gotta be jokin’, eyelashes on a car. Or make-up. Anyway…I’m sure that car has a name.